The past decade has seen a spike in research testing the use of mindfulness in the treatment of many physical and mental health problems. 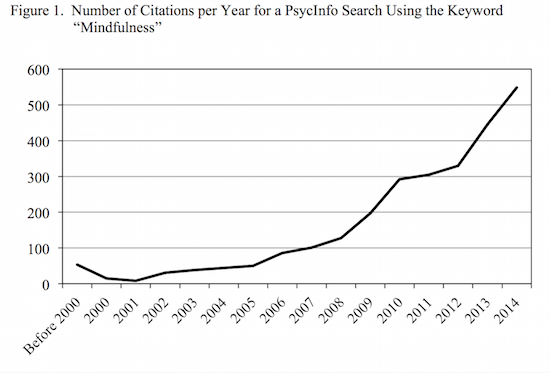 As one example of the increasing popularity, a PsycInfo search using the keyword “mindfulness” identified 2,672 peer-reviewed articles published through 2014. When citations are separated by year, the recent popularity is clearly evident (see Figure 1)! This body of research has found evidence supporting the efficacy of mindfulness as a treatment or adjunct treatment for anxiety, cancer, chronic pain, depression, diabetes, eating disorders, PTSD, and substance use disorders, to name a few. In addition to the research demonstrating the efficacy of mindfulness for clients, a smaller, but also growing, body of research has tested the utility of mindfulness for psychotherapists. The existing research examining the benefits of mindfulness for psychotherapists has demonstrated that it can lead to personal benefits such as reduced stress and greater self-compassion (Aggs & Bambling, 2010; Cohen & Miller, 2009; Schure, Christopher, & Christopher, 2008; Shapiro, Brown, & Biegel, 2007), as well as the development of psychotherapy skills such as increased comfort with silence and the ability to show empathy (Aggs & Bambling, 2010; Greason & Cashwell, 2009; McCollum & Gehart, 2010; Moore, 2008; Schure et al., 2008). Less research has examined whether the therapists’ use of mindfulness is associated with client and session outcomes. Studies examining the relationship between psychotherapist mindfulness and treatment outcomes have produced mixed results. In one study, Stanley, Reitzel, Wingate, Cukrowicz, Lima, and Joiner (2006) tested the correlation between self-reported mindfulness and client outcomes for 23 therapists from a psychology department training clinic. While therapist mindfulness was not related to clients’ ratings of their own improvement, it was actually negatively correlated with termination GAF scores and therapists’ ratings of their clients’ improvement. Although informative, this study was limited given its correlational nature and the fact that outcome ratings were based on therapist judgment, which does not always match client-reported treatment outcomes. In contrast to the findings from Stanley et al. (2006), two studies conducted by Grepmair and colleagues have found more favorable results for therapist mindfulness. In the first, Grepmair, Mitterlehner, Loew, and Nickel (2007) compared inpatient treatment outcomes for psychiatry residents who engaged in daily Zen meditation for nine weeks to treatment outcomes that had been observed during the nine weeks prior to beginning the daily meditation. Compared to clients seen during the first nine weeks, clients who were seen during the Zen meditation period showed a greater reduction in symptoms by the end of their inpatient stay. In the second, Grepmair, Mitterlehner, Loew, Bachler, Rother, and Nickel (2007) randomly assigned a group of psychiatry residents to either a nine-week daily Zen meditation group or a control group (no meditation). Similar to their first study, compared to clients seen by the control group of therapists, clients who were seen by the therapists who practiced daily Zen mediation showed a greater reduction of symptoms by the end of their treatment. Although promising, the results of these two studies conducted by Grepmair and colleagues are limited in generalizability because they were conducted in the same German inpatient hospital; they only tested one method for promoting mindfulness (Zen meditation); that method was relatively intense for the study period (1 hour of meditation per day); and the trainees were comprised exclusively of psychiatry residents. Given the inconsistent findings and the limitations of the existing studies, we recently conducted a pilot study examining the impacts of a five-week mindfulness training for beginning psychotherapists (Ivanovic, Swift, Callahan, & Dunn, Under Review). Participants were 31 trainees who were completing their in-house practicum at one of two psychology department training clinics. Client ratings of session effectiveness were recorded for two weeks before and after the mindfulness training program. Those sessions that were conducted after the mindfulness training were rated by clients as being more effective (d = .30). Although the results of our pre- post pilot study were promising, the study did not include a control condition. Thus, it is difficult to conclude that the improved ratings were actually due to the mindfulness training. The purpose of the current study was to further examine the effectiveness of a brief 5-week mindfulness training against a control condition using a cross-over design. In this study we have collected data on therapists’ ratings of their state and trait mindfulness, therapists’ ratings of their in- session presence, clients’ ratings of their therapists’ in session presence, and clients’ ratings of the effectiveness of the psychotherapy sessions. Graduate students from two psychology department training clinics (20 at each university) in separate regions of the U.S. were recruited to participate in this study. These two clinics are the in-house practicum training sites for five graduate programs, including an M.S. in clinical psychology (n = 10), a Ph.D. in clinical-community psychology (n = 10), a Ph.D. in clinical psychology (n = 6), a Ph.D. in counseling psychology (n = 8), and a Ph.D. in clinical health psychology (n = 6). The average age of the trainees was 27.2, and the majority of them identified as female (70%) and Caucasian (75%). Seven of the trainees were in their first year of training, 12 in their second, 19 in their third, one in fourth, and one in fifth year. In this study we used a crossover design which allowed us to compare the mindfulness training to a control condition, but still allowed all participants to receive the mindfulness training during the course of a semester. 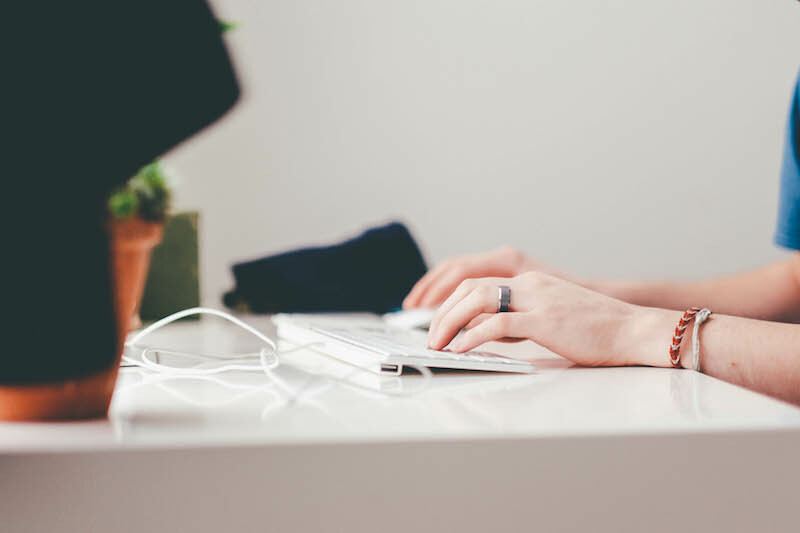 During the baseline period all of the therapist participants completed a demographic form and a baseline assessment of state (Toronto Mindfulness Scale) and trait (Five Facet Mindfulness Questionnaire) mindfulness. Additionally, for one week all adult sessions conducted by the participating therapists were evaluated by their clients using the Session Rating Scale and Therapist Presence Inventory-Client. Therapists also rated their level of presence in these sessions using the Therapist Presence Inventory-Therapist. Therapists were then randomized into either the mindfulness training (MT) or the control group (wait). After five weeks of MT or wait, the therapists’ again completed measures of trait and state mindfulness and for one week the session measures were administered at the end of all sessions that were conducted. Then, therapists who were originally assigned to the control group received the MT and those who originally received the MT waited for five weeks for a follow-up assessment. Last, after this second set of trainings, the same assessment procedures for therapist state and trait mindfulness and session effectiveness and presence occurred. Five Facet Mindfulness Questionnaire (Administered at each of the three assessments)—The FFMQ (Baer, Smith, Hopkins, Krietemeyer, & Toney, 2006) is a commonly used measure of trait mindfulness that includes 39 self-report items. Adequate internal consistency and predictive validity have been reported (Baer et al., 2008). Session Rating Scale (Administered at the end of all therapy sessions during the three week-long assessment periods)—The SRS (Johnson, Miller, & Duncan, 2000) is a 4-item measure of session effectiveness completed by clients at the end of their therapy sessions. Adequate internal consistency, test-retest reliability, and sensitivity to change have been reported (Duncan et al., 2003). Toronto Mindfulness Scale (Administered at each of the three assessments after a brief mindfulness exercise)—The TMS (Davis, Lau, & Cairns, 2009) is a commonly used measure of trait mindfulness that includes 13 self-report items. Adequate internal consistency has been reported (Lau et al., 2006). Therapist Presence Inventory-Client (Administered at the end of all therapy sessions during the three week long assessment periods)—The TPI-C (Geller et al., 2010) is a 3-item measure asking clients to rate their therapists’ level of presence in the preceding session. Adequate internal consistency and predictive validity have been reported (Geller et al., 2010). Therapist Presence Inventory-Therapist (Administered at the end of all therapy sessions during the three week-long assessment periods)—The TPI-T (Geller et al., 2010) is a 21-item measure asking therapists to rate their level of presence in the preceding session. Adequate internal consistency and predictive validity have been reported (Geller et al., 2010). Mindfulness Training—A manualized, five-week mindfulness training program that we developed and tested in our pilot study (Ivanovic et al., Under Review) was used in this study. 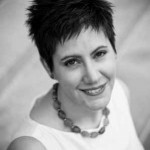 Broadly speaking, the training program was developed based on the principles from Jon Kabat- Zinn’s MBSR program, except it was abbreviated to a five-week program and additional applications for the therapists’ use of mindfulness were discussed. Each weekly session was offered in a group format and was 30 minutes long. Each session began with some general information/discussion about some of the core principles of mindfulness (Week 1: introduction to mindfulness; Week 2: acceptance and non-judging; Week 3: letting go and patience; Week 4: trust, beginner’s mind, and non-striving; Week 5: applications to therapy and therapeutic presence). Following the general information/discussion, group participants were led in a formal mindfulness exercise (Week 1: a mindful breathing exercise; Weeks 2 & 3: a mindful thought exercise; Weeks 4 & 5: a mindful centering exercise). Homework was then assigned, including daily formal (practice of the exercise that was used in the training program during the week) and informal (e.g., mindful eating, mindful teeth brushing) practices and brief readings from Jon Kabat-Zinn’s (2012) book Mindfulness for Beginners. During the five training weeks, participants were also asked to record their engagement in the mindfulness exercises that were assigned as daily homework. A copy of this manual may be obtained through either of the Principal Investigators. 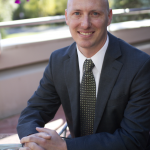 In conducting this project we had hypothesized that, compared to the control group, those who received the mindfulness training first would show greater improvements in therapist self- reported state and trait mindfulness and presence during session and client-reported therapist presence and session effectiveness. Here we present preliminary findings for the therapist self- reported state and trait mindfulness. The more detailed findings of ratings of therapist presence and session effectiveness will be reported in a later peer-reviewed manuscript. Similar trait mindfulness (FFMQ) scores were observed at baseline for the mindfulness-first, M = 135.38, SD = 16.91, and the wait-first group, M = 131.33, SD = 13.03. After the first five weeks of training, the mindfulness training group reported higher levels of trait mindfulness, M = 144.08, SD = 10.57; while the wait-first group showed no change in reported levels of trait mindfulness, M = 132.58, SD = 13.79 – d = 0.94 for the between groups comparison at this time point. 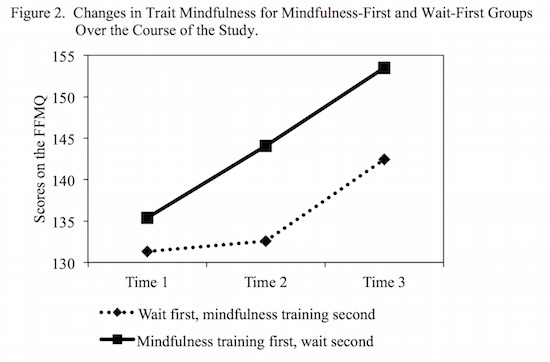 Over the course of the second five weeks during which the wait-first group also received the mindfulness training, the wait-first group reported similar increases in trait mindfulness, M = 142.43, SD = 12.47 – d = 0.79 for the improvement seen pre/post training. Even though the mindfulness-first group did not receive additional training during the second five weeks, at follow-up they reported even higher levels of trait mindfulness, M = 153.50, SD = 9.09 – d = 1.33 for the overall baseline to follow-up improvement seen in this group. Figure 2 displays these results. Prior to the mindfulness training the mindfulness-first group’s average self-reported state mindfulness score (TMS) during a formal mindfulness exercise was M = 31.18, SD = 6.64. At the end of the five weeks of training, this group’s average state mindfulness score was M = 32.29, SD = 8.27, showing a small, but non-significant improvement, d = 0.15. Prior to the mindfulness training, the mindfulness second group’s average state mindfulness was M = 31.07, SD = 8.54. At the end of their five weeks of training, this group’s average state mindfulness score was M = 33.00, SD = 9.57, similarly showing a small, but non-significant improvement, d = 0.21. These preliminary results suggest that the five-weeks of mindfulness training did improve therapists’ perceptions of their level of overall mindfulness in their lives. However, they did not see an increased ability to invoke a mindful state during a formal guided mindfulness exercise. It is possible that our particular training focused more on helping beginning clinicians develop a global ability to be mindful in their lives rather than just during a guided exercise. It may also be that participants completed their state mindfulness ratings relative to their trait mindfulness ratings. At lower levels of trait mindfulness prior to the training, participants may have more easily noticed their ability to be present during the formal exercise. Even if their ability to invoke a mindful state had improved, it may not have been as noticeable after their training due to the higher level of mindfulness that they were noticing throughout their day-to-day lives. Although improvements were only seen for trait mindfulness in these preliminary results, these findings are promising and have implications for training. Compared to the training that has been used in previous studies, the mindfulness training that was used in this study was brief (5 weeks, 30 minutes per week with brief daily practices), and so it could easily be integrated into a training setting. This type of training could also be added to a beginning therapy skills course or in a practicum/supervision setting. However, lengthier or more in depth training and practice may be needed to improve student’s ability to invoke a mindful state. In further analyzing the results, it will be interesting to see if therapist presence and session effectiveness will be rated higher after the mindfulness training. In addition, in further analyses we will examine therapists’ prior experience and knowledge of mindfulness as well as adherence to daily practices as covariates to the changes in state and trait mindfulness over the course of the training. Swift, J. K., & Callahan, J. L. (2015). 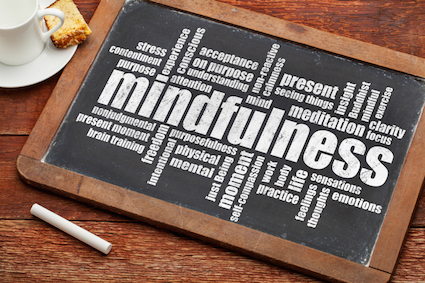 A multi-site study of mindfulness training for therapists. Psychotherapy Bulletin, 50(1), 18-23. Cohen, J. S., & Miller, L. J. (2009). Interpersonal mindfulness training for well-being: A pilot study with psychology graduate students. Teachers College Record, 111, 2760-2774. Duncan, B. L., Miller, S. M., Sparks, J. A., Claud, D. A., Reynolds, L. R., Brown, J., & Johnson, L. D. (2003). The session rating scale: Preliminary psychometric properties of a “working” alliance measure. Journal of Brief Therapy, 3, 3-12. Geller, S. M., Greenberg, L. S., & Watson, J. C. (2010). Therapist and client perceptions of therapeutic presence: The development of a measure. Psychotherapy Research, 20, 599 – 610. DOI:10.1080/10503307.2010.495957. Ivanovic, M., Swift, J. K., Callahan, J. L., & Dunn, R. (Under Review). A multi-site study of mindfulness training for counselors: The impact on session presence and effectiveness. Johnson, L. D., Miller, S. D. and Duncan, B. L. 2000. The Session Rating Scale 3.0. Chicago: Author. Schure, M. B., Christopher, J., & Christopher, S. (2008). Mind-body medicine and the art of self-care: Teaching mindfulness to counseling students through yoga, meditation, and qigong. Journal of Counseling & Development, 86, 47-56.